The Cerberus Incident is a "mini role playing game". This means is relatively short. An experienced player can complete the game in a couple of hours. The maximum level your character(s) will obtain is around level 3. Would you like to know more about The Cerberus Incident, and how to play? 1 Check out the screen shots of the program in use. 2 Read the online documentation / users's manual. 3 Read more about the game. 4 Download it for free and try it out! Changed some scorpions to 'weak scorpions' to help out first-level characters when they leave Station 1. Added a difficulty feature for those who find the game too difficult, or not difficult enough. 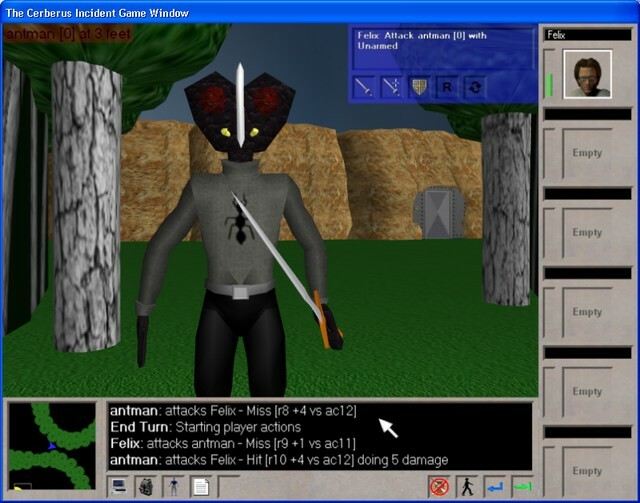 The Cerberus Incident features 3D Graphics. This requires a high performance PC, with a modern 3D graphics accelerator running DirectX 9.0 or higher. Although The Cerberus Incident is distributed as a shareware program, the game is fully functional; the only part that is disabled for unregistered users are the 'cheat' keys, which you really shouldn't use anyway. The cerberus features many exotic locations, with a total of seven research stations, each conducting their own experiments. It is up to you, Felix, to determine how these stations relate to the Cerberus Experiment and how to shut down Cerberus so that you can escape the Island. Click here for a walkthrough of The Cerberus Incident.